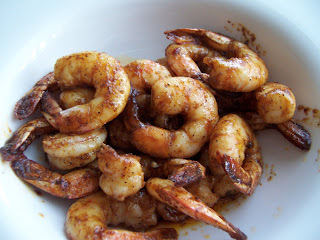 These shrimp are rubbed down with a Southern-BBQ style dry rub, and with a quick saute in butter they can be done within 5 minutes of guests walking in the door. They are finger-licking with a a smoky flavor, and are the perfect companion to a cold beer. For an appetizer, serve this with lots of napkins. For a meal, serve over steamed rice with a salad or vegetable on the side. Preheat skillet, melt butter. Meanwhile, toss shrimp with dry ingredients. 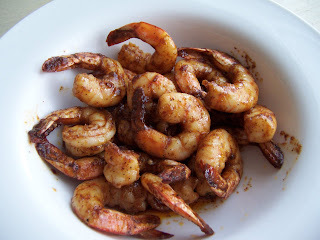 Saute shrimp for 2-3 minutes or until just done. Serve immediately. Yep, I'd love these with a cold beer.. do you think they'd go well with cabbage rolls? hahahaaa! You always make me so hungry!! 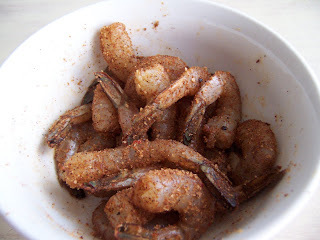 When I was a kid I loved shrimp, couldn't get enough of them especially if they were dipped in batter and fried. I'm sure I would have loved these too! BBQ anything is delish. I have been having serious shrimp cravings lately. This looks like just the recipe to fix the craving! Those do look good. I will definitely try these. This looks great. A strange thing happened this weekend when I took a shrimp dish to a BBQ and someone got freaky about there being legs and shell still attached. Mine were headless and cut down the back so it was a simple peel. Meanwhile more authentic eateries will serve them whole. From what I've learned one should always try to cook "in shell" to preserve moisture. Thoughts? I just bought a big bag of raw frozen jumbo shrimp and have been searching for the perfect recipe to try. Usually I put shrimp in pasta because it's so delicious and fail-proof, but this recipe look much more figure friendly! I'll try it tonight and let you know how it goes!